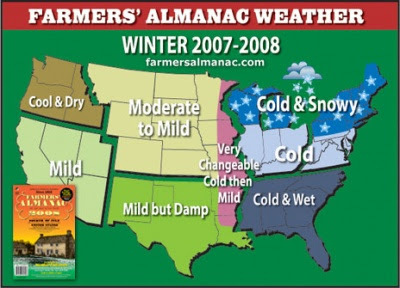 For those of you 'worried' about the Winter (or lack thereof) after our Hot August, I have some news from the good folks at the Farmers' Almanac. I took a spin around their website and found the Winter 2007-2008 Outlook. Looks 'interesting', doesn't it? Their weather section has some good information. Click here to go there. Well cold and wet sounds good to me.